Canadian artist Kenneth M. Kirsch was born in Toronto Canada in the mid 1950s. Ken received a Graphic Design education from Seneca College in the 1970s and has since had a very successful career in Graphics and Advertising. 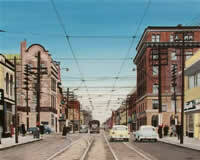 institutions as Eaton's, Gray Coach Lines/Toronto Transit Commission and Brigden's Photo Studios, to name but a few. 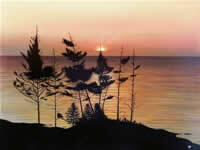 Working with acrylic and oil paint on stretched canvas, Ken paints the Canadian Landscape that he knows and loves in his own unique realist style. His paintings are seen in many fine art galleries and private art collections internationally, at an ever increasing demand and price.